What a treat to be able to add another country to the list of places Henry Reed visited! The Daily Colonist of Victoria, British Columbia reports that Reed gave a noontime poetry reading at the University of Victoria on Thursday, March 26, 1964. Reed may have gone at the invitation of Robin Skelton. 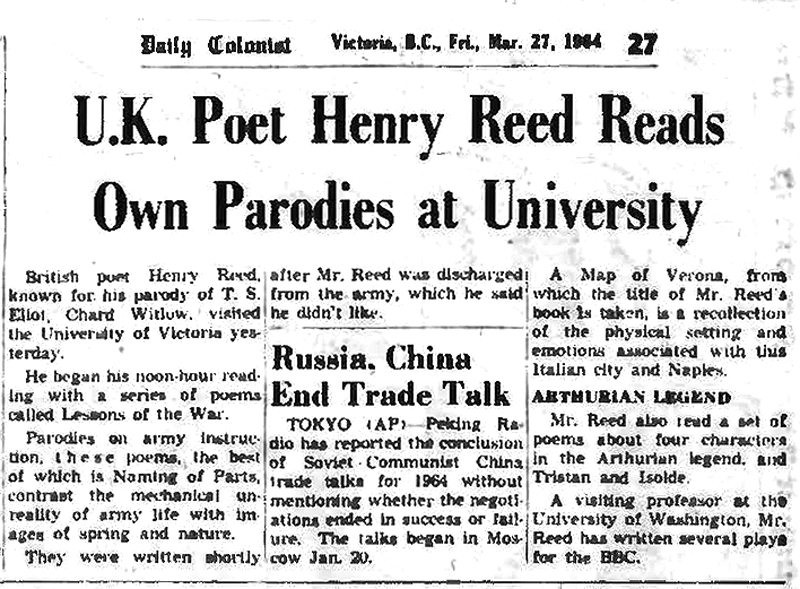 British poet Henry Reed, known for his parody of T. S. Eliot, Chard Witlow [sic], visited the University of Victoria yesterday. He began his noon-hour reading with a series of poems called Lessons of the War. Parodies on army instruction, these poems, the best of which is Naming of Parts, contrast the mechanical unreality of army life with images of spring and nature. They were written shortly after Mr. Reed was discharged from the army, which he said he didn't like. A Map of Verona, from which the title of Mr. Reed's book is taken, is a recollection lot the physical setting and emotions associated with this Italian city and Naples. Mr. Reed also read a set of poems about four characters in the Arthurian legend, and Tristan and Isolde. A visiting professor at the University of Washington, Mr. Reed has written several plays for the BBC. "Several" plays for the BBC. By my count, Reed wrote or translated 36 radio plays before 1964.